The Fagerland name came down to me through my grandfather Warren. My 2015 Great Grand Genealogy Tour (GGGT) of the Plains States included ND and MN, which are obviously very dense in Fagerland history. This post summarizes what I learned about Fagerland ancestors on the tour. It will make a little more sense if you first read the post I wrote before taking the trip. When you are ready to see what I learned, read on. ﻿﻿﻿I met many distant cousins at Orville’s funeral in Noonan, ND on July 9. Orville was Grandpa’s older brother. I had visited Orville just last year to capture some of his memories, up to a century old. I was pleasantly surprised that some of the relatives had stumbled on last year's blog post and recognized me from that. 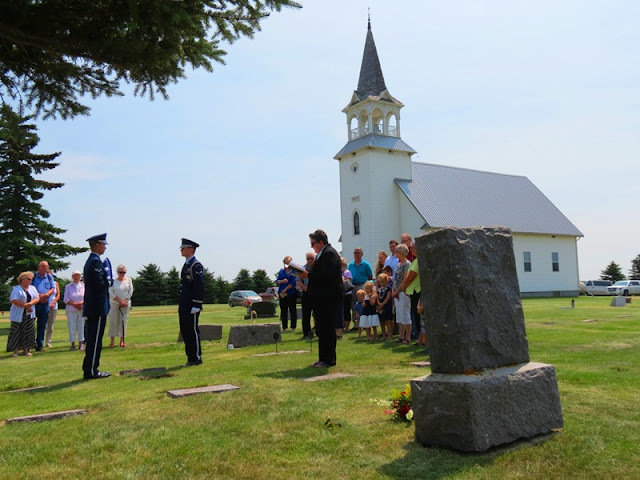 Here is one of my favorite pictures from the service, with the Fagerland family stone in the foreground. Other photos will be posted to my photography website in coming months. Then it was time to go adventuring in Minnesota. Grandpa’s mother, my GGM Augusta Sandver-Fagerland, grew up in northwestern MN. Her parents, my 2nd-Great-Grandparents Sandver, came to America when Augusta was a child. 2GGM Sandver’s parents, my 3GGPs Svare, accompanied them too, so it was a tri-generational voyage from Norway to Minnesota. 2GGPs Sandver and 3GGPs Svare are buried there now in Otter Tail County, east of Fargo, ND. The Sandvers’ name has been forgotten in the US, as they had no sons. Most Minnesota locals think of their family as the “Andersons”, the married name of their second daughter Jennie. The Sandver graves had not even been posted to FindAGrave before my visit. I made sure to take pictures of the markers and post them on their profile. 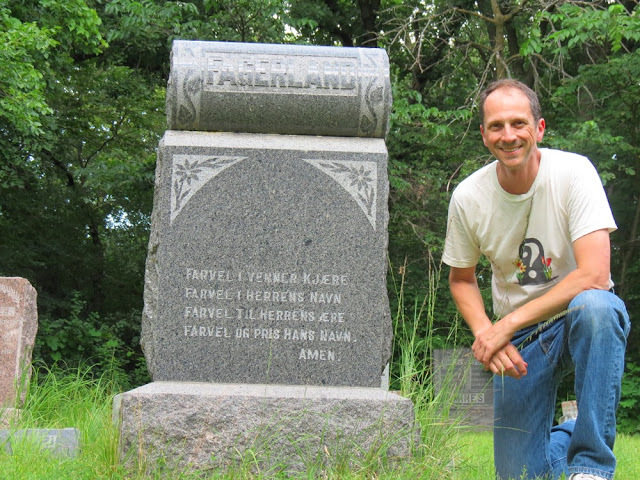 Great-Grandpa Fagerland, Knut, grew up in southwestern MN about 100 miles from Great Grandma. This locality had been pretty much forgotten by the family, as Knut and his parents all ended up in Noonan. My 2GGPs Ole and Mary Fagerland only came to Noonan within the last few years of their life. Prior to that, they were well-settled landowners in Yellow Medicine County, MN for four decades. Knut’s mother, my 2GGM Fagerland, has been an enigmatic figure in our family history. The family tree that we got from Deloris in the 1970s, which Knut started, extensively traces Ole’s ancestry. But all that Knut wrote of his mother was that her maiden name was Mary Anderson and that she married Ole in 1870. That was it! I only recently found out that she was Swedish; Orville corroborated that all-but-forgotten family knowledge. Since last year, I have been on a quest for pictures of Ole and Mary and for any information about Mary’s past and her family. I struck out last year, but now I have finally made some breakthroughs. Here is the family tree I learned this year both before and during the trip. (Note: the program I had available to draw this chart only allowed me to build a family tree downward, not upward, so it looks up-side-down with parents appearing below their children). Our Swedish branch of the family came from Kronoberg County (near the southern tip), specifically the parishes of Slatthog, Goteryd, and Ljungby. Historically in Scandinavia, women did not assume their husbands’ surnames. Everyone was named after their fathers; thus, Johannes Anderson was Anders’ son, and Johanna Mansdotter was Mans’ daughter. Sometimes but not always, families added a place-name: “Ole Hanson Fagerland” means “Ole, Hans’ son, who comes from the Fagerland farm.” Our family eventually Americanized, though the nomenclature was inconsistent and confusing in the immigrant generations. Knut’s father, Ole, only adopted the surname “Fagerland” in the 1890s when he was middle-aged. Prior to that time, he was known only as Ole Hanson. In fact, the name on Knut’s birth certificate is Knut Hanson, and he had to file an affidavit with a court to legally change his name to Knut Fagerland. My poor 2GGM Mary went through the surnames Jonsdotter, Anderson, Hanson, and Fagerland. They were clearly not thinking about their genealogist descendants when they did all this flip-flopping! Speaking of Mary, my distant cousin Darlene was right. She did have a photo! She knew that this woman was named Mary, but didn't realize it was her own great-grandmother until we got together. Aside from the clear family resemblance, her identity is corroborated by Grandpa’s memory; he saw a different picture of her when he was a kid. It seems that Ole’s pictures might be lost forever, making him the only 2nd-great grandparent that I have never seen! I confirmed that Mary's father, my 3GGF Anderson, is buried in Trinity Cemetery, where the family had gone to church. Only the church’s overgrown foundation is left, and his grave is unmarked, but the cemetery is well-kept and I got to visit it this summer. There is a large “Fagerland” headstone there for my 3rd-great-uncle Jacob Fagerland (cover photo). Mary’s obituary said that her father brought her to St. Peter, MN at age 9 in 1858. Her father Johannes lived with Ole and Mary until he was about 85, then apparently went to a caretaker and lived to age 96. I had never seen any mention of Johannes’s wife, so I assumed that she had died young in Sweden. In the Salt Lake Family History Library on my way home, I made a very intriguing discovery in a Swedish census. Johannes’s family entry included his second wife Johanna Mansdotter, their daughter (my 2GGM) Maria, and a younger son Anders. Their names were crossed off the record book with the note that they all left for America in 1854! That leaves us with a compelling mystery of what happened between 1854 and 1858. Where were they? Is 3GGM buried in American soil after all? Why did she die young in that time frame? Did their son Anders live to start a family of his own? This is just speculation, but I wonder if they may have gone to Wisconsin before Minnesota. Wisconsin was the original destination for Swedish immigrants, and Minnesota was pretty unsettled at that time. Those were my Fagerland discoveries of 2015. As you can see, genealogy is a never-ending quest of answering satisfying questions and opening new puzzles to be solved! Meyer, Beck, and Korb posts to follow.